On June 27, the United States Supreme Court issued its decision on the case of Janus v. AFCME. At issue in this case is whether public sector unions can collect dues or fees from all of its members, even those who disagree with their union while still benefiting from the benefits and protections their unions achieve through collective bargaining. Below is our statement on the ruling, which we release on the day of the decision, June 28, 2018. “Today’s ruling abandons over 40 years of precedent. It shows five judges can’t handle the truth that strong labor unions have played a central role in building a more equitable economy and putting meaningful checks & balances on corporate power. The Janus case came before the court as the result of a decades-long, multi-billion-dollar campaign to shift money and power from workers to the wealthy. It also came with an accidental poetic flourish: Janus is the Roman god of beginnings and endings, of change and transition, of passageways connecting past and future. Here in Washington, we’re already leading the way to new futures for workers rights. Working Washington and Fair Work Center have partnered with unions and community groups over the past several years to win the nation’s first $15 minimum wage law, Seattle’s landmark secure scheduling ordinance, paid sick days, paid family leave, and more. We’ve scaled up new approaches to community-based outreach & enforcement of worker rights laws. We’re building a groundbreaking Seattle Domestic Workers Alliance that will take nannies & house cleaners from invisible to powerful. And more. Two weeks ago, Washington Attorney General Bob Ferguson announced that his office reached a settlement with seven national fast food chains to end the “no poaching” policies that prevented workers from moving to different franchises with potentially better wages, benefits or opportunities for advancement. Many economists believe these types of policies lead to wage stagnation among low-wage workers in retail and fast food. The agreement not only applies to franchises in Washington, but will be applied to chains nationwide. 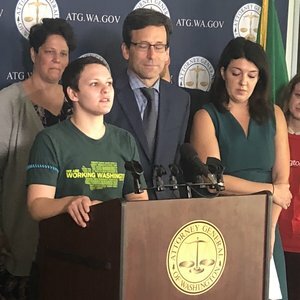 Both Rachel, our new ED, and Merlee Sherman, a fast food worker and Working Washington member, stood with AG Ferguson for his press conference. Here is what Merlee had to say about the settlement. Ahmed, a Somali man who works for a hotel in Seattle, came in to the Legal Clinic after being injured on the job. After his first injury, he had requested a reasonable accommodation from the hotel, and his supervisor denied his requests and then made derogatory comments about his English. He also cut Ahmed’s hours. Ahmed tried to continue working without an accommodation but was injured two more times over the course of the following six weeks. The Legal Clinic helped Ahmed file a complaint with Seattle Office for Civil Rights, which is now investigating his case. In addition, the Legal Clinic helped him file a worker’s compensation complaint with Washington Department of Labor & Industries. The worker is now receiving pay for time lost while he is out of work recuperating. 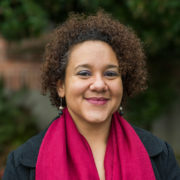 Maria works at non-profit preschool as a teacher assistant in Seattle. She has pre-existing medical conditions that requires her to take time off during shifts to go to doctor appointments. The lead teacher is very hostile to her, calling her names, making fun of her skin color, and physically accosting her on the school’s playground in front of the children. Her employer refused Maria’s request to reassign her to a different classroom away from her abusive lead teacher. The Fair Work Legal Clinic helped the worker file a complaint with Seattle Office for Civil Rights, which is now investigating the matter. We also connected Maria to an attorney who will be representing her without charge. Roger is an African American man who worked at a marijuana retailer in Seattle as a floor supervisor. He was discriminatorily denied a promotion to manager so he contact the Fair Work Legal Clinic. The Legal Clinic helped the worker file a complaint with the Seattle Office of Civil Rights. We quickly learned that many other workers had experienced similar discrimination on the job. In addition, we learned that the employer had implemented an invalid tipping policy, and several other workers had been threatened for bringing up the issue. We assisted the worker in filing a charge with Office of Labor Standards (OLS). Roger also mobilized other workers to talk with OLS. And within one week of his complaint, OLS sent a letter to his employer identifying all of the issues and requiring the company prove they are in full compliance with Seattle’s labor standards. The employer has one month to demonstrate compliance or OLS will initiate a full investigation. 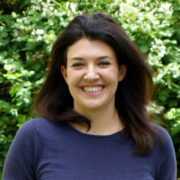 Andra Kranzler, former staff attorney, new program director! 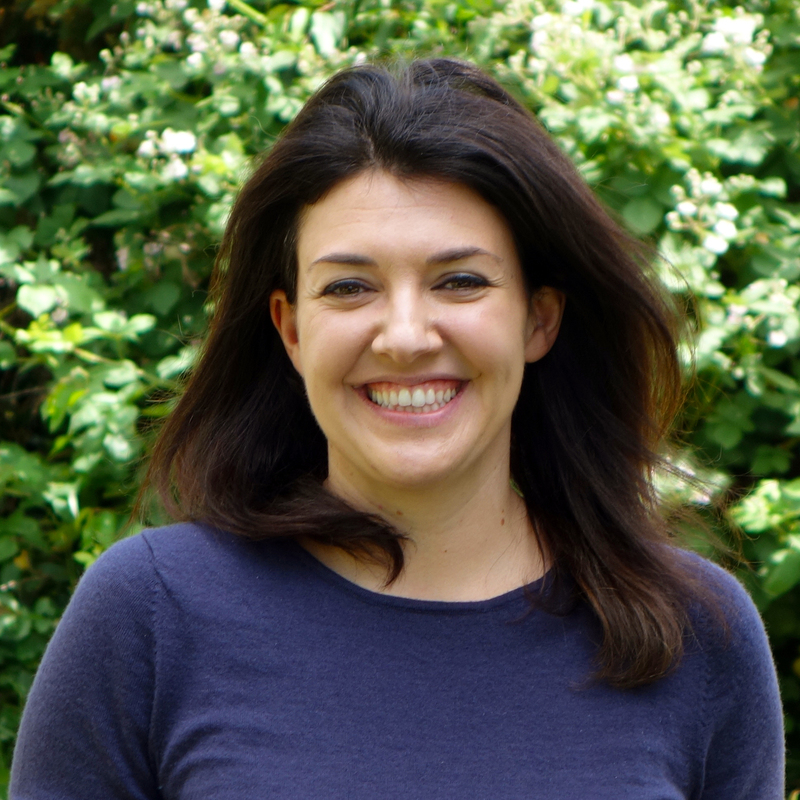 In this edition of Fair Work News, we are sitting down with Andra Kranzler, our new Program Director at Fair Work Center. For the past year, she was the Intake and Outreach Staff Attorney in the Fair Work Legal Clinic. In her previous role, Andra had one foot firmly in both sides of Fair Work Center’s work, supporting our outreach and education team by attending Know Your Rights trainings and providing legal consultations with workers in the field. In our conversation, she shares some of the exciting things she has been up to in her work and where she sees her new role taking her and the organization. Until just this week, I was the Intake and Outreach Staff Attorney, and I viewed my role as the bridge between our community education and our legal services. I see myself as a “community economic justice lawyer,” meaning I am doing much of my lawyer work out in the community, meeting people in real time to talk to them about their issues and help them strategize solutions. As the Program Director, I will continue to be that bridge, making our legal services more accessible to low-wage workers, even as I step away from the lawyering side. For the past year, I worked closely with our outreach and engagement team to increase access to justice for the workers we meet through our Know Your Rights trainings by being present and offering legal consultations in the field. I also helped conduct trainings, weighed in on policy issues, and developed materials to meet the specific needs of our partners. One of my favorite things was to be out in community, meeting with our partners and supporting them in whatever way I could. I envision doing even more of that in my new role. You do a lot of work bringing legal information and advice out to the organizations that we partner with. Can you share some examples of what that looked like in your previous role? Last summer, just after I started at Fair Work Center, I attended the annual summer BBQ of Got Green, one of our Fair Work Collaborative partners. There, I met a one of the incredible staff at the Tenants Union of Washington (TU) and we got to talking about trying to do something together, recognizing that someone’s housing crisis may have started out as a crisis at work. For example, if someone shows up at the TU with a notice to pay rent in three days or be evicted, it might be because they weren’t getting paid at work. Initially, the TU Invited me to one of the legal clinics they host for people with housing issues, and I was there as a resource for anyone who had an issue on the job. Today that relationship has grown deeper. We now co-host an employment/housing legal clinic on the third Tuesday of every month at the TU offices. Our goal is to intervene early and mitigate the number of people who risk eviction or homelessness due to wage theft or other issues at work. We’d love to expand this partnership and provide similar services in the coming months to reach more workers outside of the Seattle area. Another exciting project that came from working with our community partners is a training we created specifically on sexual harassment. The Latino Community Fund is also a Collaborative partner, and a few months ago they asked Fair Work Center to do a short training on sexual harassment for one of their women empowerment workshops. One of the things we highlighted in that training is that in Washington State, even undocumented Latinas have rights on the job, which was really uplifting for the women in the workshop who face so many intersecting issues as women, Latinas, immigrants and workers. The training was so well received that the Latino Community Fund asked us to come back and give that same training to their staff and board. We are also offering the training with some of our other partners who have requested something specific to sexual harassment, like the YWCA. I have also partnered with Open Arms, Legal Voice and the law firm MacDonald Hoague & Bayless to create a workshop for pregnant workers and new mothers coming back to work that is based on the Washington Healthy Starts Act of 2017, which requires employers to provide reasonable accommodations for pregnant women and new moms. We are doing a second training in Spanish this summer with Casa Latina. In addition, I worked with the Restaurant Opportunity Center of Seattle and the Seattle Bartenders’ Guild to create a special workshop on wage and hour laws for tipped workers, as well as participate in an administrative rule-making process with Washington Department of Labor & Industries as it drafts guidance materials for tipped workers in Washington. Very impressive! As you transition to this new role as Program Director, what are you most excited about? I am most excited about getting an opportunity to dive deeper into worker issues with our Collaborative and community partners, to identify strategies that empower workers to exercise their rights and expand upon those rights, either individually or collectively. Before anyone can exercise their legal rights, they must know their rights. This work, in my mind, is still community lawyering. While I am no longer representing individual workers, I am helping community-based organizations and our collaborative partners address systemic economic injustice by standing shoulder to shoulder with workers, helping them understand their rights and what they can do to make a difference. We need a multi-pronged strategy. I look forward to working with our new sibling organization, Working Washington, in helping to build and shape our worker movement so that all people working in Washington experience fairness at their job. RE: ATTORNEY GENERAL BOB FERGUSON’S ANNOUNCEMENT REGARDING “NO POACHING”... Join us for the Future of Worker Power!